There was a time when kettles and teapots are known for one traditional design- the one that is made from stainless steel and features the hard-to-ignore red push button. As soon as the kettle starts to boil, it will make a whistling sound which can be considered convenient and a safe feature for many people. There’s the red push button too that should be pushed in order to pour the hot coffee or tea into the waiting cups. These are the basic features of the traditional teapots available in the market. But thanks to changing customer requirements and the latest innovations, new designs for teapots are made available. Some of the leading teapots now fuse functionality, convenience and great designs thus making these teapots as lifestyle products. One popular product worth a try is For Life teapot; this is one brand that takes the initiative to revamp the looks of the traditional teapots to come up with chic and highly functional teapots. The For Life brand is known to offer functional and unique-looking kettles, but the design considerations are not the best things that make the brand the best. What makes this tea infuser kettle a hit among many households and tea enthusiasts is the presence of the 0.3mm stainless steel tea infuser, an extra fine infuser that allows you to come up with a perfect brew every time. The extra-fine design consideration of the infuser will allow you to steep different varieties of tea leaves, such as the Rooibos tea leaves. But it doesn’t mean that you can say goodbye to the other types of fresh tea leaves. This tea infuser can also work wonders with larger tea leaves like the Oolong tea leaves. You can even use the classic tea bags in these teapots for that instant tea experience. But for many shoppers, the main selling point of the ForLife Stump Teapot is its design. This is a smart addition to the kitchen thanks to the use of the stackable design. This means that you can easily stack one after the other, thus allowing you to save on storage area. 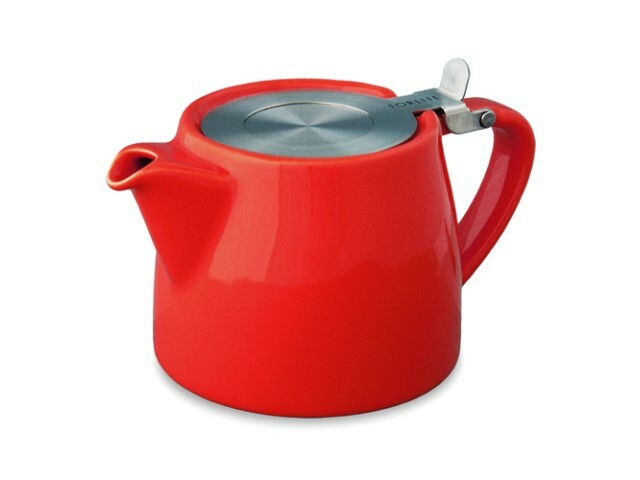 Thanks to this feature, this brand of teapot is great for use in cafes, restaurants and bars. These types of teapots are also best for the homeowner with limited countertop space but still want to own a number of teapots. Also, the teapots are available in a variety of colors. There are at least nine colors to choose from, and some of the popular colors out in the market include Red, Carrot, Mandarin, Lime and Marine making this brand a fun addition to your kitchen. Find A Great Deal On The Top 5 For Life Teapots Right Now!